ROSSBURG, Ohio (June 25, 2016) - The “Wild Child” Jac Haudenschild certainly lived up to his label on Saturday night at Eldora Speedway, earning the Ohio Sprint Speedweek presented by Cometic Gasket finale worth $10,000 with the Arctic Cat All Star Circuit of Champions. Haudenschild, pilot of the familiar Phoenix Racing/No. 59, took command of the 30-lap feature program on lap 17, surviving traffic and constant pressure from Chad Kemenah and Tim Shaffer on the very topside of the speedway. The Wooster, Ohio, native now owns 30 career victories with the Arctic Cat All Star Circuit of Champions, two of which occurring during the 2016 season. Tim Shaffer would cross under the final checkers second, followed by Chad Kemenah, Randy Hannagan, and Danny Holtgraver. Jac Haudenschild won the battle, but Chad Kemenah won the war, claiming the 2016 Ohio Sprint Speedweek presented by Cometic Gasket title worth $1,000. It is a second ever Ohio Sprint Speedweek championship for the Alvada, Ohio, native and a first ever title for car owner Rob Hunter. 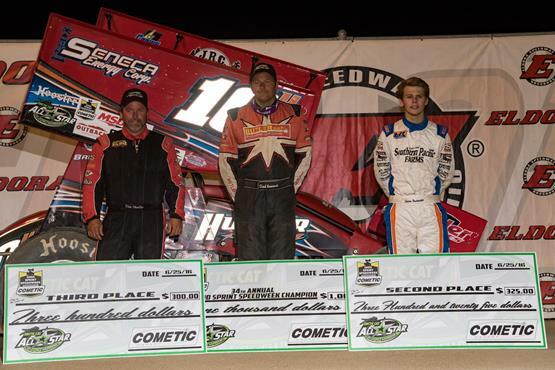 Sheldon Haudenschild finished second in the overall Ohio Sprint Speedweek presented by Cometic Gasket title chase, followed by Tim Shaffer, Dean Jacobs, and Kraig Kinser. With the runner-up finish during the Ohio Sprint Speedweek presented by Cometic Gasket finale, Chad Kemenah officially takes control of the Arctic Cat All Star Circuit of Champions title chase, holding a mere 14 point advantage over defending champion Dale Blaney leading into Independence Day weekend. The Arctic Cat All Star Circuit of Champions will continue their 2016 campaign with a pair of events in the state of Michigan. “America’s Series” will invade Hartford Speedway and I-96 Speedway during Independence Day weekend, highlighted with the inaugural Dirty 30 presented by Tony Stewart at I-96 Speedway in Lake Odessa on Sunday, July 3. Hartford Speedway in Hartford, Michigan, will kick off the holiday weekend doubleheader with competition on Saturday night, July 2. Each program will award $5,000. Dirty 30 tickets at I-96 Speedway are now on sale. Those interested should visit www.allstarsprint.com, or visit Ticketforce online at https://tickets.ticketforce.com/eventperformances.asp?evt=1474. Those seeking additional information regarding the upcoming events at Hartford Speedway and I-96 Speedway should visit each facility live on the Web at www.hartfordspeedway.net and www.i96speedway.com.